CAPE CANAVERAL, Florida (AP) - The privately bankrolled Dragon capsule made a historic arrival at the International Space Station on Friday, triumphantly captured by astronauts wielding a giant robot arm. SpaceX is the first private company to accomplish such a feat: a commercial cargo delivery into the cosmos. "There's so much that could have gone wrong and it went right," said an elated Elon Musk, the billionaire maestro of SpaceX. "This really is, I think, going to be recognized as a significantly historical step forward in space travel - and hopefully the first of many to come." NASA astronaut Donald Pettit used the space station's 58-foot (18-meter) robot arm to snare the gleaming white Dragon after a few hours of extra checks and maneuvers. The two vessels came together while sailing above Australia. "Looks like we've got us a dragon by the tail," Pettit announced from 250 miles (400 kilometers) up once he locked onto Dragon's docking mechanism. NASA controllers applauded as their counterparts at SpaceX's control center in Hawthorne, California - including Musk - lifted their arms in triumph and jumped out of their seats to exchange high fives. The two control rooms worked together, as equal partners, to pull off the feat. The company's youthful-looking employees - the average age is 30 - were still in a frenzy when Musk took part in a televised news conference. They screamed with excitement as if it were at a pep rally and chanted, "E-lon, E-lon, E-lon," as the 40-year-old Musk, wearing a black athletic jacket with the SpaceX logo, described the day's events. Alcohol was banned from the premises during the crucial flight operation, Musk noted, "but now that things are good, I think we'll probably have a bit of champagne and have some fun." The crowd roared in approval. Not only that, the reusable SpaceX Dragon is designed to safely return items, a huge benefit that disappeared with NASA's space shuttles. It's the first U.S. craft to visit the station since the final shuttle flight last summer. Two hours after the capture, the crew attached the Dragon to the space station as the congratulations poured in. "Now that a U.S. company has proven its ability to resupply the space station, it opens a new frontier for commercial opportunities in space - and new job creation opportunities right here in the U.S.," NASA Administrator Charles Bolden said in a statement. "Nearly 43 years after we first walked on the moon, we have taken another step in demonstrating continued American leadership in space," said Apollo 11's Buzz Aldrin, the second man to step onto the moon. The bell-shaped capsule- 19 feet (5.8 meters) tall and 12 feet (3.7 meters) across - is carrying 1,000 pounds (454 kilograms) of supplies on this unprecedented test flight. The crew starts unpacking Saturday and will have just under a week to unload the food, clothes and other contents. After this test flight, SpaceX - officially known as Space Exploration Technologies Corp. - has a contract to make a dozen delivery runs. It is one of several companies vying for NASA's cargo business and a chance to launch Americans from U.S. soil. 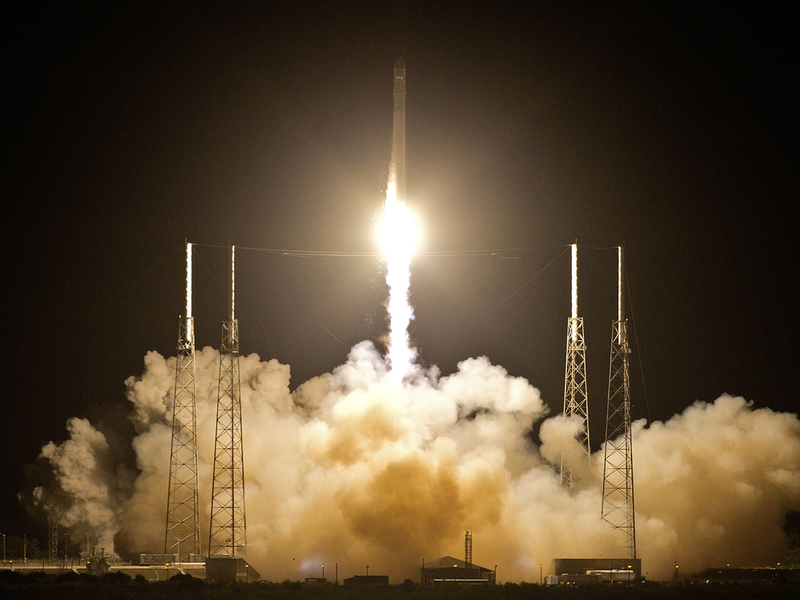 SpaceX launched the capsule from Cape Canaveral on Tuesday with its Falcon 9 rocket. On Thursday, the Dragon capsule came within 1 1/2 miles (2 kilometers) of the space station in a practice fly-by. It returned to the neighborhood early Friday so Pettit, along with Dutch astronaut Andre Kuipers could capture it with the station's robot arm. Given that the Dragon is a brand new type of vehicle and this is a test flight, the space agency insisted on proceeding cautiously. A collision by vehicles traveling at orbital speed - 17,500 mph (28,200 kph) - could prove disastrous for the space station. NASA's space station program manager, Mike Suffredini, said the way the SpaceX team handled the problem and the entire operation was "remarkable." President Barack Obama is pushing commercial ventures in orbit so NASA can concentrate on grander destinations like asteroids and Mars. Obama's chief scientific adviser, John Holdren, called Friday's linkup "an achievement of historic scientific and technological significance."